Reese's Pieces: HAPPY BIRTHDAY REESE!!! Well, I made it! After a night of ripening up Mommy's cervix and about 1 hr 40 min of pushing. 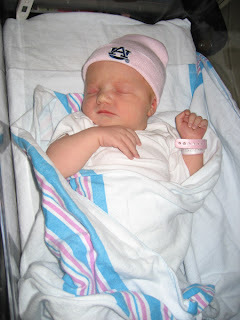 I finally popped out at 11:58am on 2-15-07. I am 7lbs. 11 oz. and 20 3/4 inches long. I've got red hair like my Daddy! I have my Mom's nose and long fingers. I like to cry! Somtimes I turn a little blue when I get upset, so they are taking extra special care of me in NICU. I'm happy to be here and can't wait to meet all of you. "Wow,..what a trip I just went through,..WHEW!" Getting warm under the heating lamp! 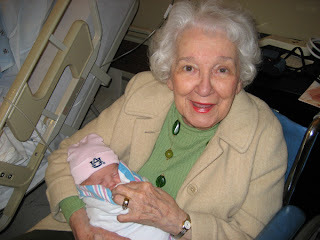 Me and Great Grandmama! Her name is Elizabeth too! Snug as a bug in a rug! Oh,..and WAR EAGLE! My only question is: Where is the Baby Princess Leia costume?? That's gotta be in there somewhere!